CHINESE: Zhou ye suan mo. FRENCH: Oseille crépue, Parèle, Patience crépue, Patience sauvage, Reguette, Rumex crépu. KOREAN: So ri jaeng i, So ru jaeng i.
PORTUGUESE: Cata-cuz, Labaça, Labaça-crespa, Labaça-selvagem, Língua-de-vaca, Paciência (Brazil). 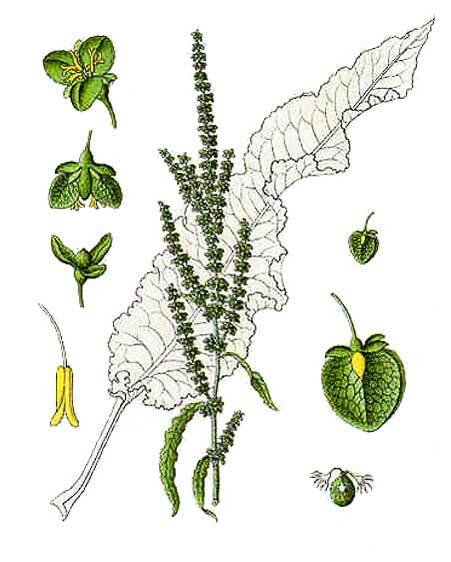 SPANISH: Acedera crispada, Gualtata, Hidrolapato menor, Lengua de caballo, Lengua de vaca, Pira de verraco, Regalo-da-horta, Romaza, Romaza crespa, Vinagrillo. Curly dock is an erect, simple and sparingly branched plant, growing to a height of 30 to 90 centimeters. 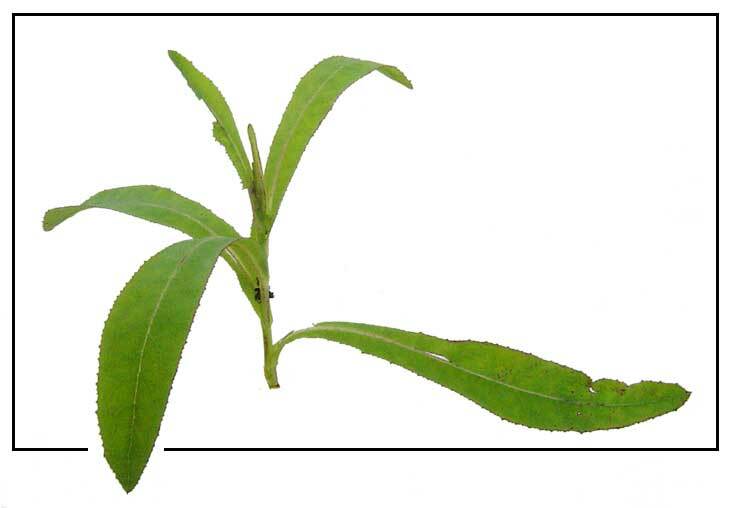 Leaves are variable in shape, the lower leaves, oblong to oblong-lanceolate, 1.5 to 30 centimeters long, the upper leaves narrowly oblong or lanceolate, 8 to 16 centimeters long, with either sharp or obtuse apex, and rounded at the base. Panicles are rather dense and not leafy. Valves are entire, usually tubercles number 3. Achene is oblong-ovoid, 2 millimeter long. - Recently introduced to the Benguet area; sparingly naturalized at altitudes of 1,400 to 2,200 meters. - Native of Europe and now a widely distributed weed in temperate countries. - Roots contain 0.2% and the twigs a trace of oxymethyl-anthraquinone. - Dried root yields 0.1% of emodin, and slightly less of chrysophanic acid. - Plant has yielded tannic acid. - Also yields oxalic acid and rumicin, a tasteless, golden-yellow substance, which is irritant and has been used to destroy skin parasites. - Root yields anthraquinone and calcium oxalate; the leaves yield emodin and brassidinic acid. - Anthraquinones identified include nepodin, chrysophanol, physcion, emodin, chrysophanic acid, and rhein. - Flavanoid compounds identified: quercitrin and quercetin. - Yields minerals: iron, sodium, potassium, magnesium and calcium. - Root is mildly purgative and astringent, tonic and febrifuge. 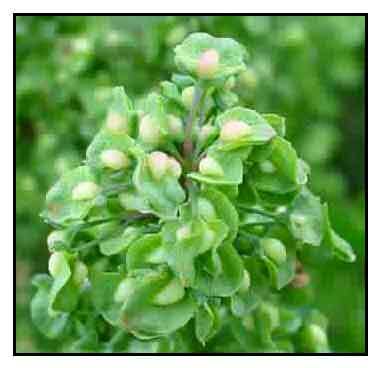 - Plant traditionally used as 'blood purifier,' tonic and astringent. - Alterative, antiscorbutic, depurative, laxative, tonic. - Young leaves reportedly used as vegetable. - Root decoction used for fevers. - Fresh bruised roots for skin ailments, dermatitis and skin rashes. - Root decoction used for jaundice, constipation, psoriasis; laxative effect attributed to anthraquinone. - Also used to stimulate bile production. - Liver problems and arthritis. - Used for acute and chronic inflammation of nasal passages. - Used as treatment for tapeworms and roundworms. - For vascular disorders and internal bleeding. - Applied externally to ulcers, boils and tumors. - Roots and seeds used for nausea, chronic dysentery, and hepatic disorders. - Decoction of roots for purgative effect and liver problems. - In Indo-China, root decoction used for intermittent fevers. Sometimes referred to as "poor man's ginseng." • Antimicrobial: In an evaluation of four medicinal plants for antimicrobial activities, the acetone extracts of the roots of Rumex crispus and A rotundifolius demonstrated significant inhibitory effects against most of the test microorganisms ( S aureus, B subtilis, A hydrophylla, K pneumonia, P aeruginosa and C albicans). • Because of high oxalic content, leaves should not be eaten in large amounts. • Because of oxalate content, should be avoided in those with kidney stones, rheumatism, gout. • Probably unsafe in pregnancy because of anthraquinone content. • Anthraquinone is secreted in breast milk, and therefore a concern for breast feeding mothers. Supplements, extracts, teas, oils and pellets in the cybermarket. Fatal poisoning by Rumex crispus (curled dock): pathological findings and application of scanning electron microscopy./ Reig R, Sanz P et al / Vet Hum Toxicol. 1990 Oct;32(5):468-70. Studies on the chemical constituents of Rumex crispus / Fan J P, Zhang Z L / Zhong Yao Cai. 2009 Dec;32(12):1836-40. Sorting Rumex names / Authorised by Prof. Snow Barlow / Maintained by: Michel H. Porcher / MULTILINGUAL MULTISCRIPT PLANT NAME DATABASE / Copyright © 1997 - 2000 The University of Melbourne. Fatal poisoning by Rumex crispus (curled dock): pathological findings and application of scanning electron microscopy. / Reig R, Sanz P, Blanche C, Fontarnau R, Dominguez A, Corbella J. / Vet Hum Toxicol. 1990 Oct;32(5):468-70.